In food processor, mix the drained roasted red peppers, tomatoes, chipotle chile powder, sugar, cumin and worcestershire sauce until smooth. 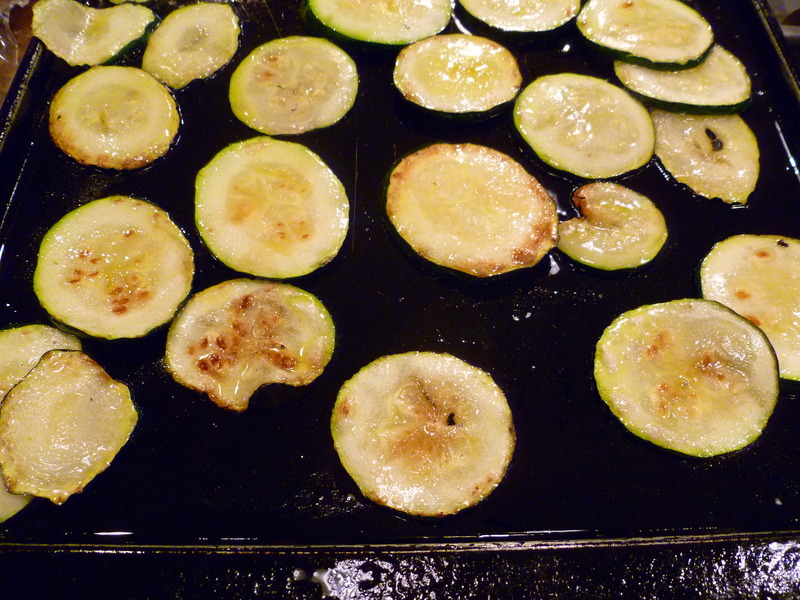 Heat the olive oil in a sauce pan over medium heat and saute onions with a pinch of salt for 4-5 minutes until softened. Add the garlic and saute for another 2-3 minutes. 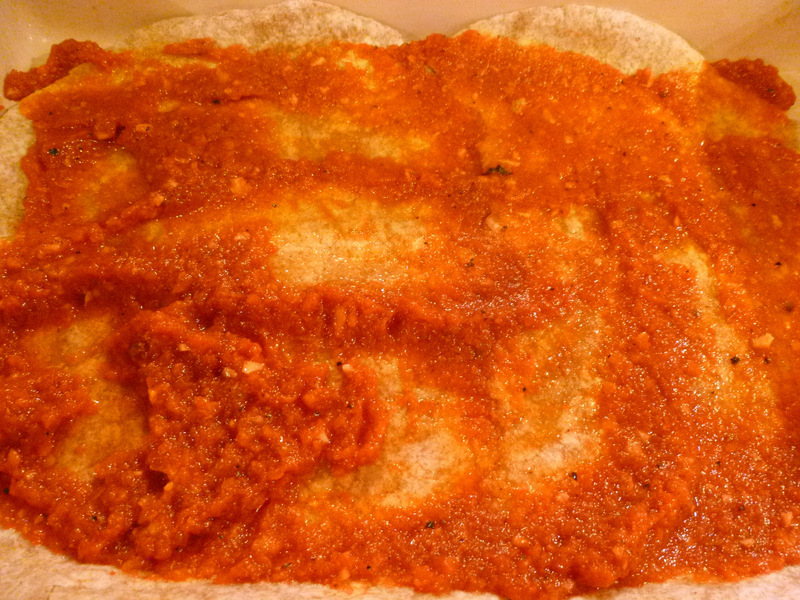 Remove from the heat and add to the processor with the red pepper sauce and blend again until smooth. Season with salt and pepper to taste, if desired. Pour this mixture back into the saucepan and bring to a simmer. Simmer for about 15 minutes, stirring frequently until reduced to about half and thickened. Set aside. Heat olive oil in a large skillet over medium-low heat. Add in the mushrooms and saute about 3-4 minutes. Add in garlic, thyme, oregano and salt and pepper to taste. Saute a few more minutes until mushrooms are tender. Set aside. 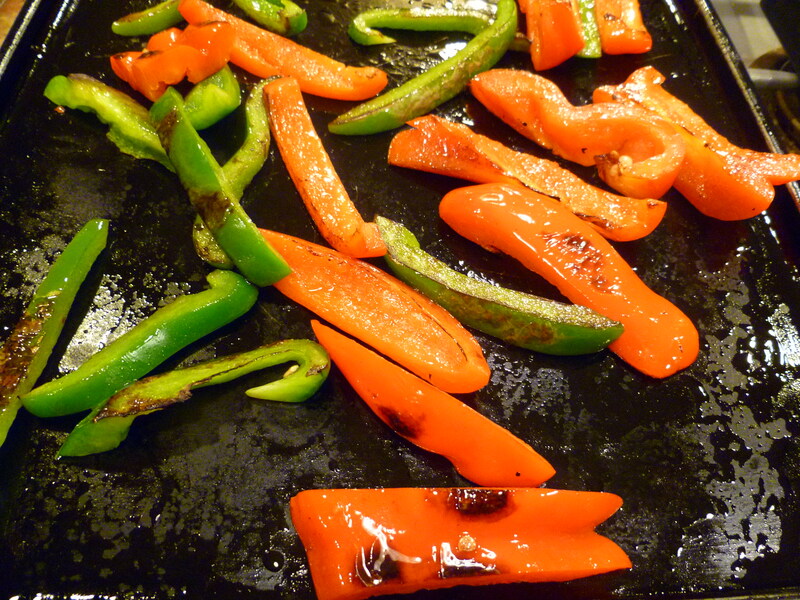 On a large griddle or oversized skillet, heat canola or a high heat resistent oil over medium or medium high heat. 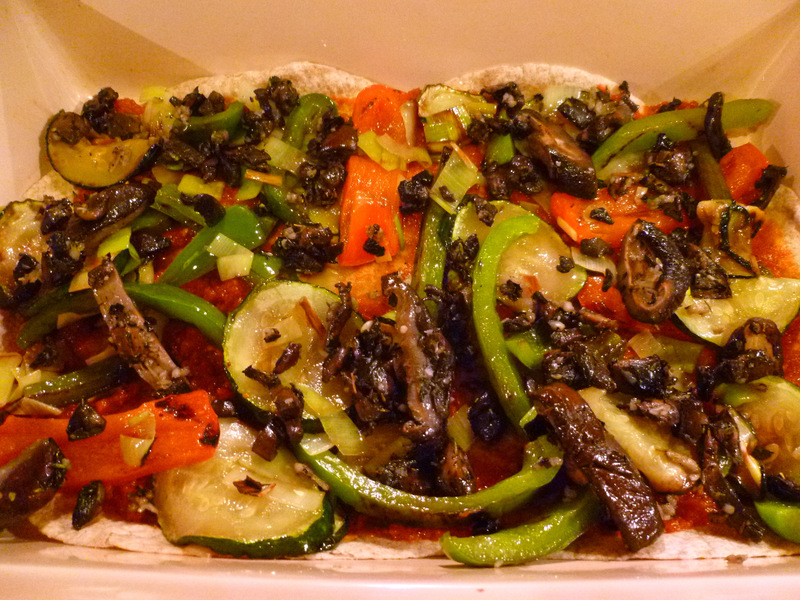 In single layer batches, grill the zucchini, red and green peppers and leeks until tender and partly browned (see photos). 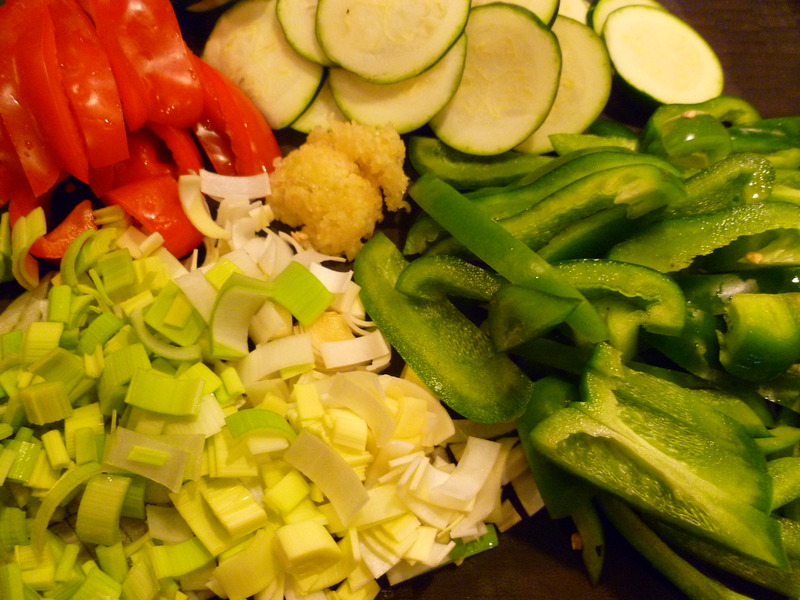 Set veggies aside as they are cooked and add in more in single layer until all veggies are cooked. 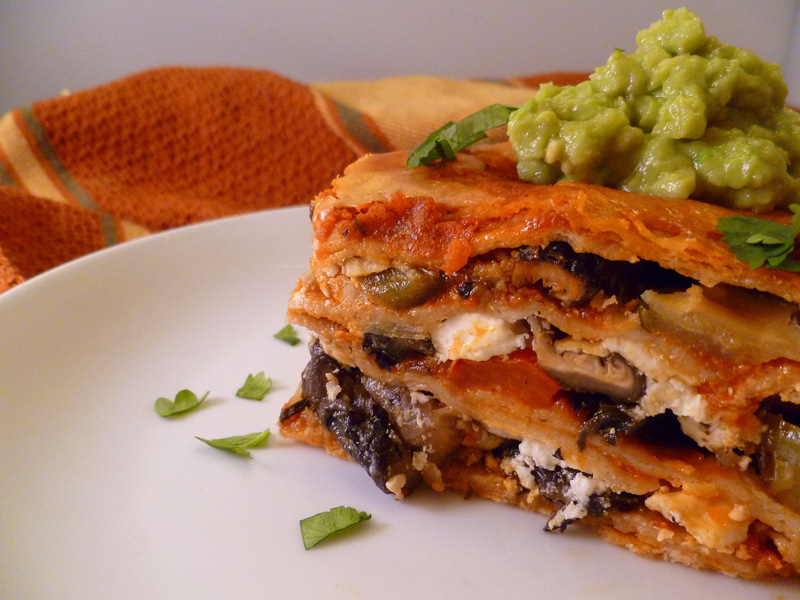 In casserole or lasagna dish, layer 2 tortillas on the bottom, overlapping then tearing away the double layer (see photo). 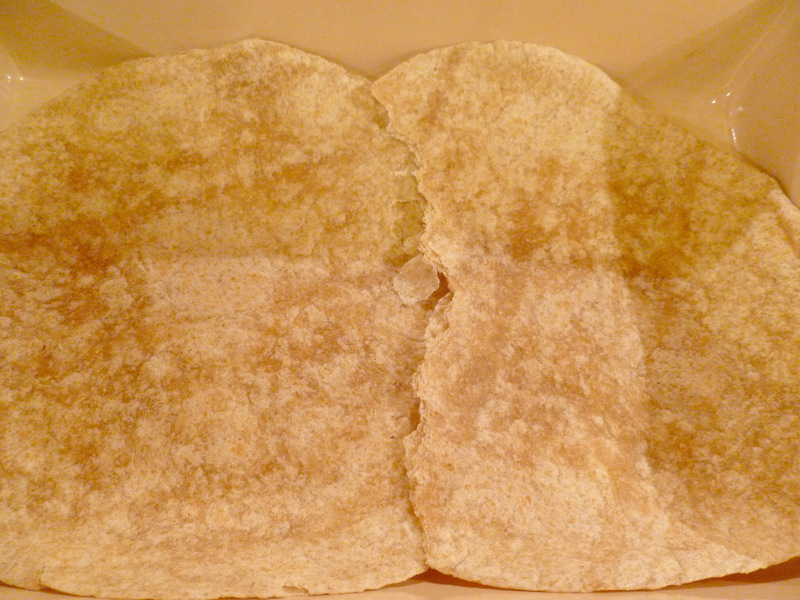 The pieces you tear away can be placed in the corners where there may be a gap in tortillas. Scatter 1/3 of the veggies over the sauce. Repeat the layers 2 more times starting with the tortillas. On top of the last layer, put two more tortillas, the rest of the red pepper sauce (you should only have a few tablespoons left) and 1/2 cup cheddar cheese. 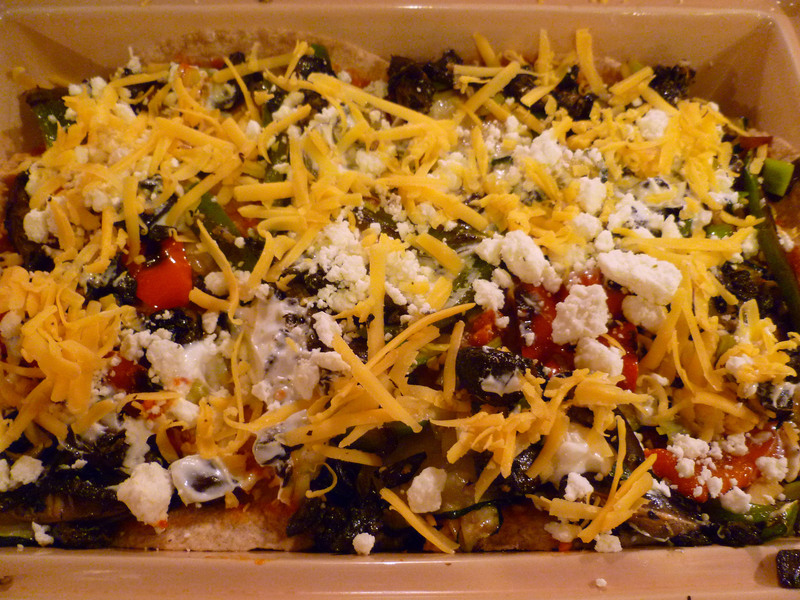 Cover the dish and place in the oven for 40 minutes. 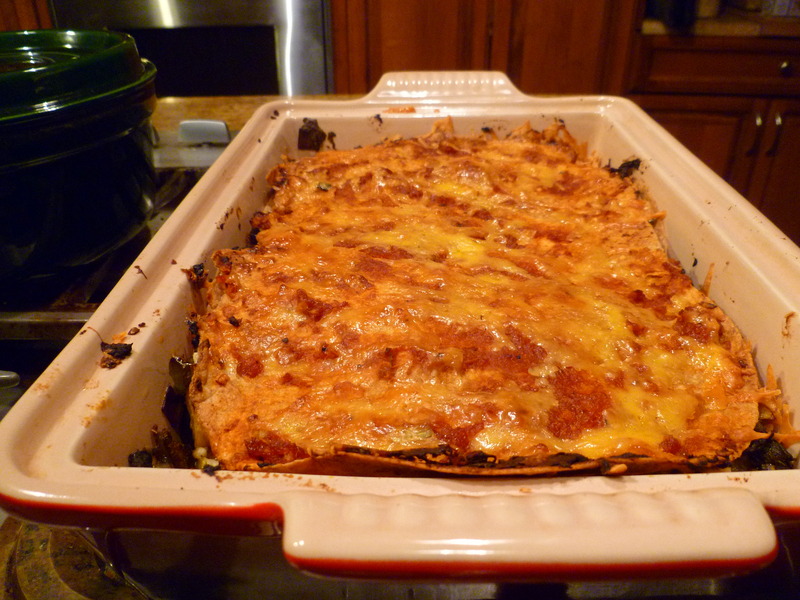 Remove cover then bake an additional 10-15 minutes or until the cheese is bubbling and slightly browned. Serve with salsa and guacomole or my avocado butter. Make sure you start the red pepper sauce first as the it will need to be reduced down to about half. While it is cooking, you can start on the other items. The red pepper sauce is awesome in this. You might want to double the recipe so you have extras to garnish with. 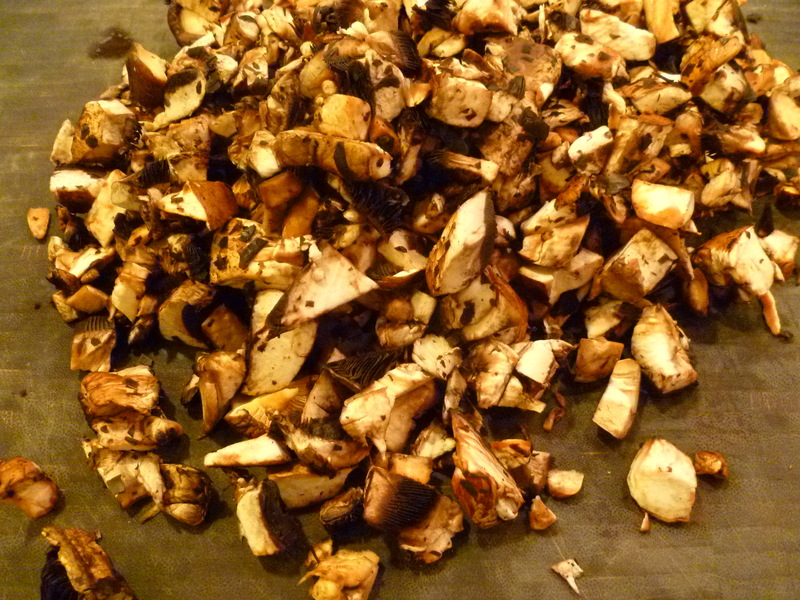 I tried this with a mix of fresh and dried, reconstituted mushrooms but found the fresh were more tender. The dried were too meaty and tough in this dish. If you love goat cheese, this dish would go beautifully with it. 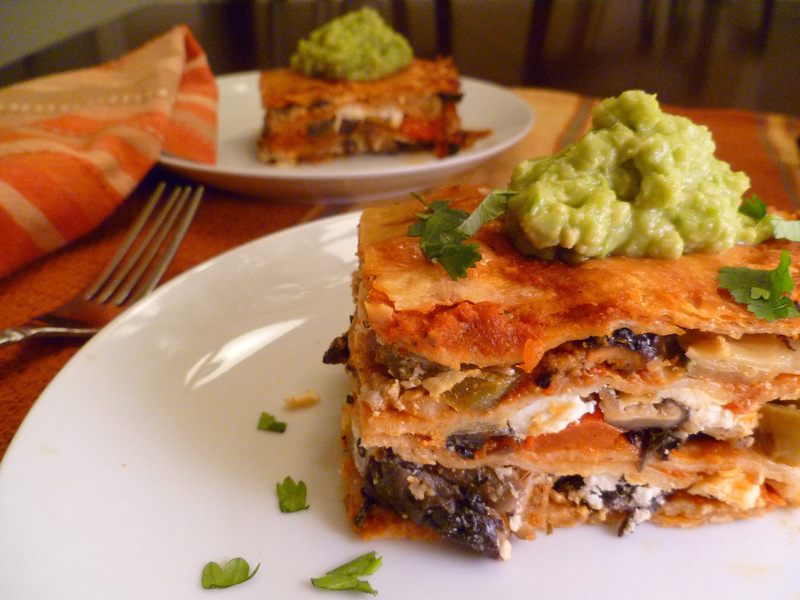 My family doesn’t especially love it so I use feta but oh, how lovely this would be with goat cheese! 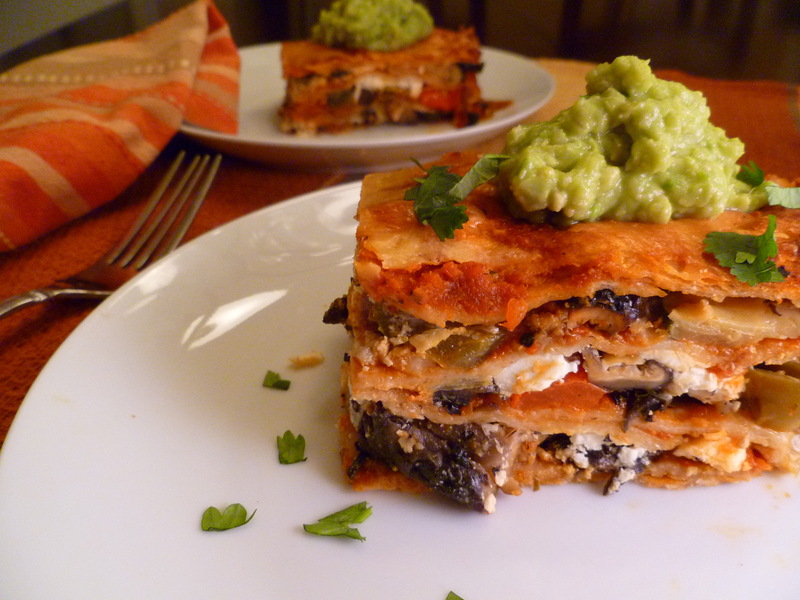 To make this vegan, eliminate the cheddar and feta cheese and substitute the sour cream for a vegan one. Double or triple the sour cream amount and then double the red pepper sauce recipe and spoon a few extra tablespoons along with the sour cream as well as on top of the tortilla layer as called for. On the last layer, spread at least 4-5 tbsp sauce on top and leave off cheddar cheese. Yours looks lovely! It’s my guy’s favourite dinner too, he always requests it and you’re right it is so versatile and I always make extra of the sauce for wraps or nachos, I love it!! looks delicious! 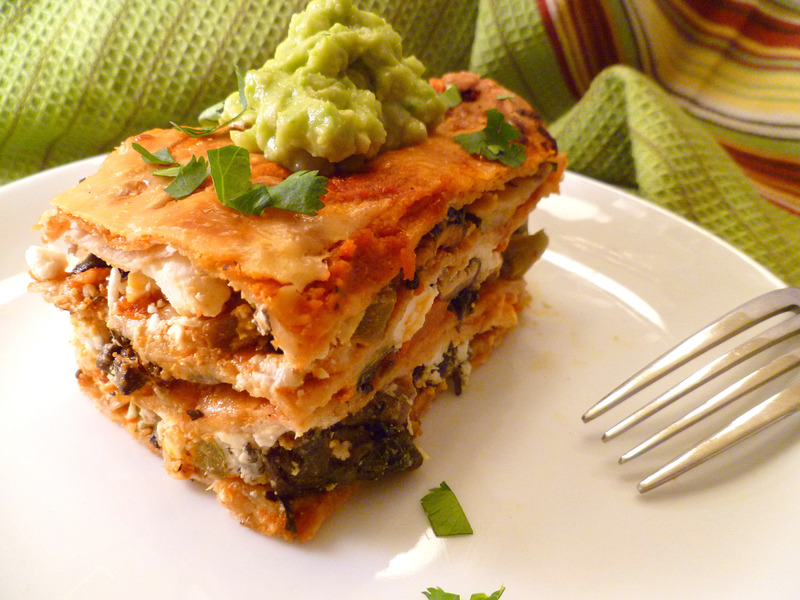 love the idea and combo of the avocado on top, yum!